“Many authorities feel (Lyme Disease) is a massively underreported issue, and one that’s increasing every year.” – Marina Makous, M.D. Lyme disease is a bacterial infection transmitted through the bite of infected blacklegged ticks (on the East Coast) and deer ticks (on the West Coast). The symptoms of Lyme disease are often wide-ranging and may occur anywhere from 3 to 30 days after the bite. Lyme disease can be particularly difficult to diagnose, as the bacterium responsible for the condition produces symptoms that mimic common illnesses. Symptoms of Lyme disease may be similar to those of a cold or flu. The bacterium that causes the condition can affect the brain and nervous system, heart, and the muscles and joints. In 2015, over 96 percent of all reported cases of Lyme disease occurred in 14 states: Connecticut, Delaware, Maine, Maryland, Massachusetts, Minnesota, New Hampshire, New Jersey, New York, Pennsylvania, Rhode Island, Vermont, Virginia, and Wisconsin. Cases of Lyme disease have been reported on every continent except Antarctica. As can be deduced from the statistics above, most cases of the condition in the U.S. are concentrated in the East and Midwest parts of the country. As the condition is often misdiagnosed, the criteria for diagnosing Lyme disease should differ noticeably from that of other illnesses – but it does not. As such, the risk factors and symptoms of the disease are best explained by medical practitioners who specialize in the condition. The species of ticks that transmit Lyme disease are discovered only in particular habitats. Lymedisease.org cites “wooded or grassy areas” as the two primary environments where ticks live. Living, exercising, or spending leisure time (e.g. camping) in wooded or grassy areas is the number one risk factor. As the condition originates via tick bite, you’d think this would be an easy thing to spot – but it isn’t. The reason is that most people who contract Lyme are bitten by an immature tick, which is about the size of a poppy seed. The insect’s diminutive size and painless bite often go unnoticed by the person. A “red expanding skin rash” is a pretty good indication that you’ve been bitten by a tick. 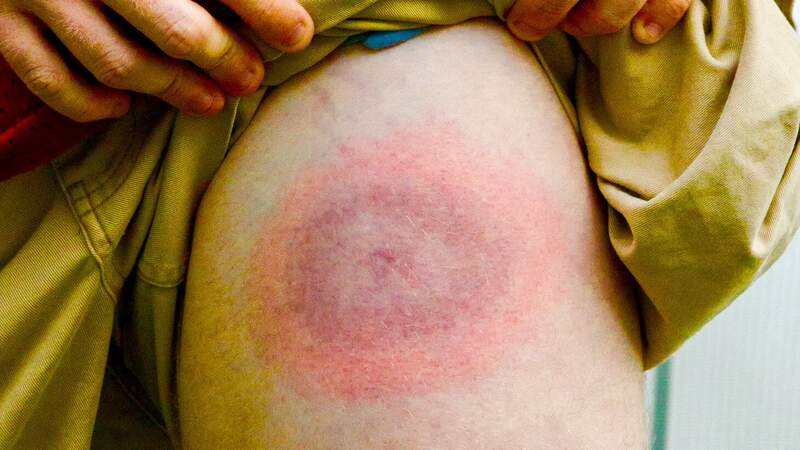 The size of the rash can differ significantly from person to person, but is usually swollen, and – in the later stages – takes on a “bullseye on a dartboard” appearance. It’s estimated that one in every three people will not form a rash. Some people will experience symptoms similar to the flu: fatigue, muscle and joint pain, high temperature (fever), headaches, stiffness in the neck, and body chills. Mistaking Lyme with influenza is very common. Should these symptoms persist and worsen past three to seven days (the “severe” symptom phase of the flu), Lyme disease is a possibility; especially if any of the abovementioned signs apply. This is definitely a scary symptom – and one that should raise the alarm. Numbness and weakness of facial muscles often result from nerve damage. Also called Bell’s palsy, these symptoms affect only one side of the face. Numbness or weakness of the face should be considered a medical emergency. Symptoms of respiratory or cardiovascular problems include chest pain, heart palpitations, and shortness of breath. Medical professionals refer to the cardiovascular problems associated with Lyme as Lyme carditis – a rapidly-progressing disturbance between nerve connections within the heart’s tissues. Even if these symptoms are subtle, which they often are in the beginning, medical attention is recommended. Executive functions within the brain can be affected during the later stages of Lyme disease. Generally, concentration and memory problems co-occur with limb pain and facial weakness. Inflammation resulting from Lyme may cause arthritis symptoms. Severe joint pain, swelling (especially in the knee area), numbness/tingling in the hands or feet, or “shooting” pains are potential indicators of Lyme disease. If knee pain and inflammation become severe, NSAIDs such as ibuprofen/Aleve may temporarily relieve the pain. However, it is in your best interest to seek medical guidance.